Greet Visitors with Holiday Cheer! 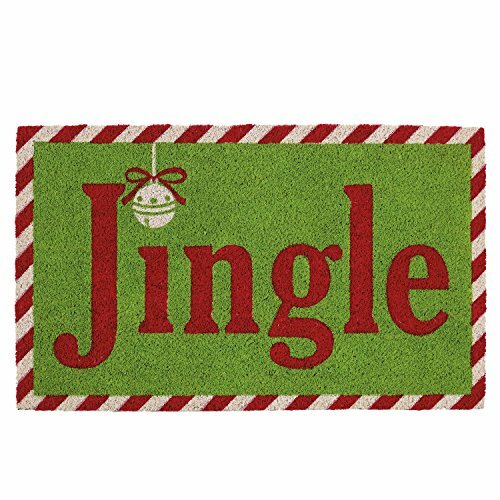 Although DII has doormats for year-round display our seasonal doormats are a must! With cute designs in bright, festive colors these will delight any caroler, friend, or guest. This 18 x 30 inch doormat is made of high-strength polyester and is capable of withstanding harsh conditions. The last thing you want your doormat to do, when your boots are muddy, is to slip out from under you. This doormat will remain in place and absorb any mud tracked by boots and shoes. This doormat can withstand extreme heat and extreme cold and stay in place no matter the conditions. This 18 x 30 inch, 100% coconut coir fiber doormat with a natural fiber face provides the perfect surface for guests to wipe their shoes before entering your home while putting a smile on their face. Available in a variety of cute and colorful styles; you will be able to find one that is just right for your home year round or swap out for a seasonal design. To view our entire selection of doormats options search: DII Doormats or visit our store front by clicking the DII link at the top of the page to view our other collections.